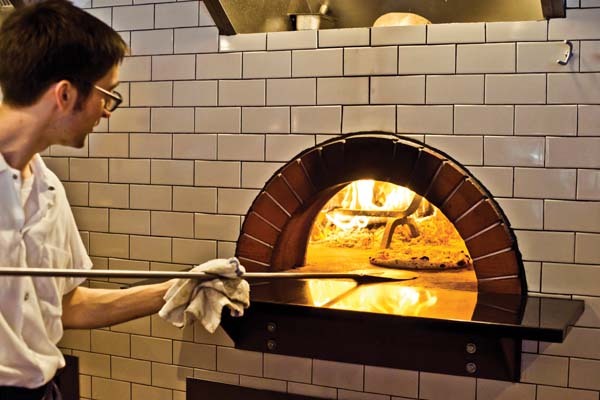 Left: There are a dozen choices of wood-fired pizzas at Mani Osteria & Bar. Right: Chef Brendan McCall. Restaurants have come and gone in the dense quadrant of downtown Ann Arbor between State and Main streets. Those still around have survived the economic downturn by being careful and sticking to a menu that made them unique. They also charged quite handsomely for food and wine. 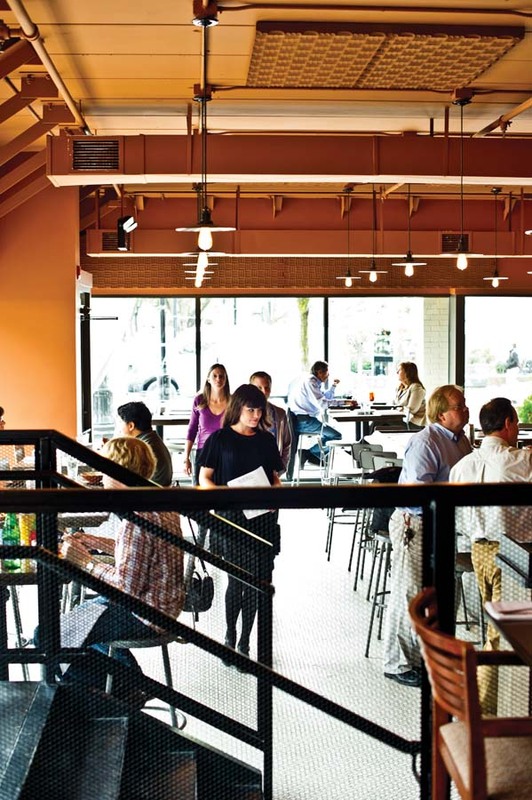 Eating out well in Ann Arbor is fun, but it has always been on the expensive side. As a business model, this has worked well. But unless a menu is spruced up now and then with new items, a restaurant risks boring its customers. 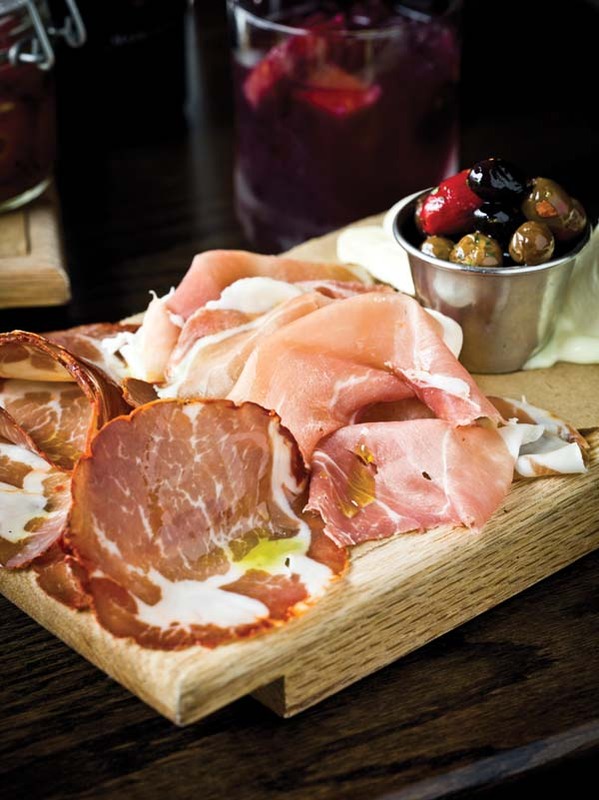 Mani Osteria & Bar, the newest casual Italian restaurant in the city, infuses freshness into the popular, busy market with lower prices and high-quality dishes. It’s charming, highly energetic, very urban, and slick, with a menu that concentrates on a sizable variety of first courses, pastas, and pizza ranging from $6 to $18 and offered in either big or small portions, which also makes for a lower bill than average. The restaurant occupies the corner of Fifth and Liberty in a modern L-shaped, glass-fronted space that formerly housed a furniture-rental store. From the street at night, it looks warm and inviting with diners seated at cozy tables and waiters rushing back and forth. The interior meanders across two levels. The entry, on Liberty, opens to a bar area with high-top tables. Up a few steps from there is the main dining room, at the back of which is an open kitchen where diners can watch chefs working the two large wood-fired pizza ovens. Top Left: “The Mix” includes a choice of two meats, two cheeses, and olives. Top Right: Mani Osteria & Bar bustles with an urban feel. 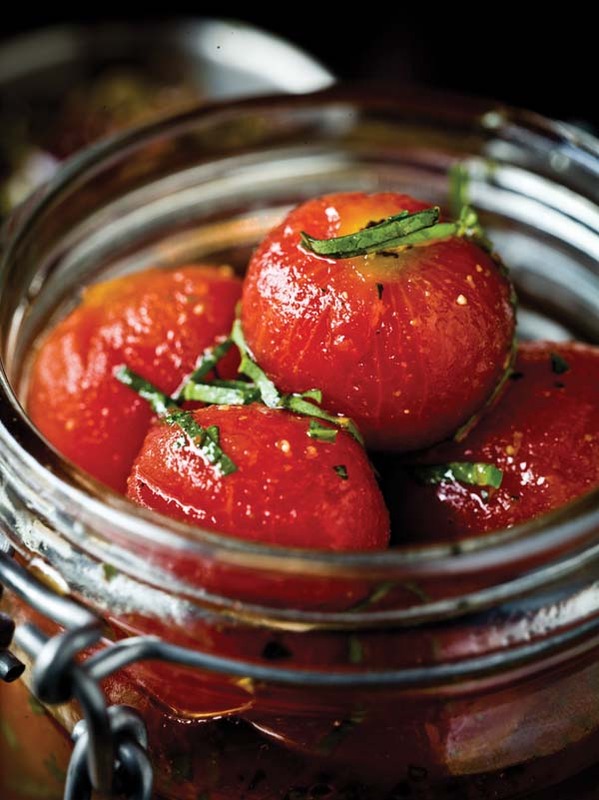 Bottom: The antipasti include Pickled Tomatoes, accompanied by whipped ricotta and tapenade. Clean lines and a subtle burgundy and rusty-brown palette add an urban feel. Unlike anything else in town, it has a low pulsating, vibrant, and bustling energy. It’s no wonder, then, that it has been consistently jammed since it opened in May. The one drawback is the noise level when the restaurant is full, something that Baru is attempting to correct. 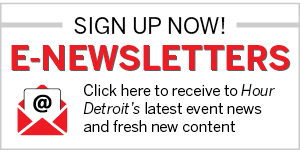 Baru, an Ann Arbor native, moved to Chicago and worked for a marketing agency that had contracts with major restaurants, which is how he developed an interest in the business. He left Chicago for Cornell University in Ithaca, N.Y., where he got a degree in hospitality management. He then worked for a summer in New York with Danny Meyer’s group, founder of the Manhattan restaurant company that owns Union Square Café, Blue Smoke, Gramercy Tavern, and several others. “I got hooked on the whole operations end of it,” Baru says. What followed was a career in Philadelphia working for Morimoto, the upper-end Japanese-themed restaurant whose chef became one of the early Iron Chefs, of television fame. 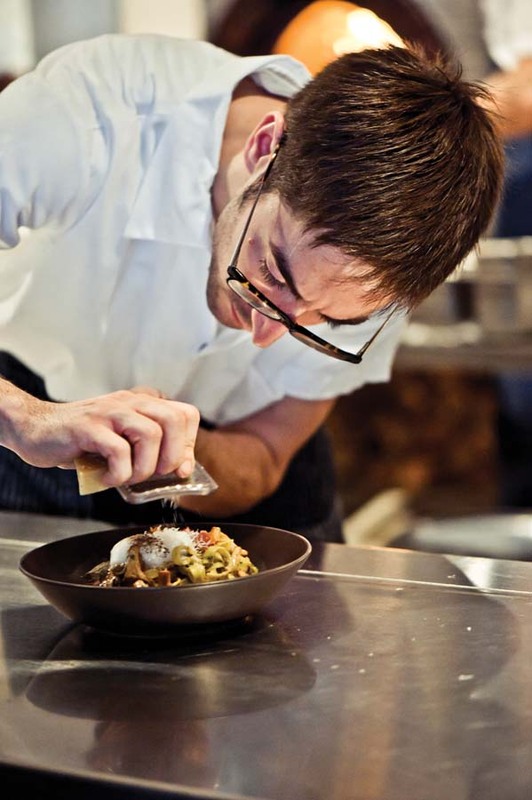 Baru also worked in Philadelphia for a group of seven restaurants — including Tinto, Amada, and Distrito — owned by a second Iron Chef, Jose Garces. “I’m one of the few general managers who can claim that I survived not one, but two Iron Chefs,” Baru says. Eventually, he decided to return to Ann Arbor. 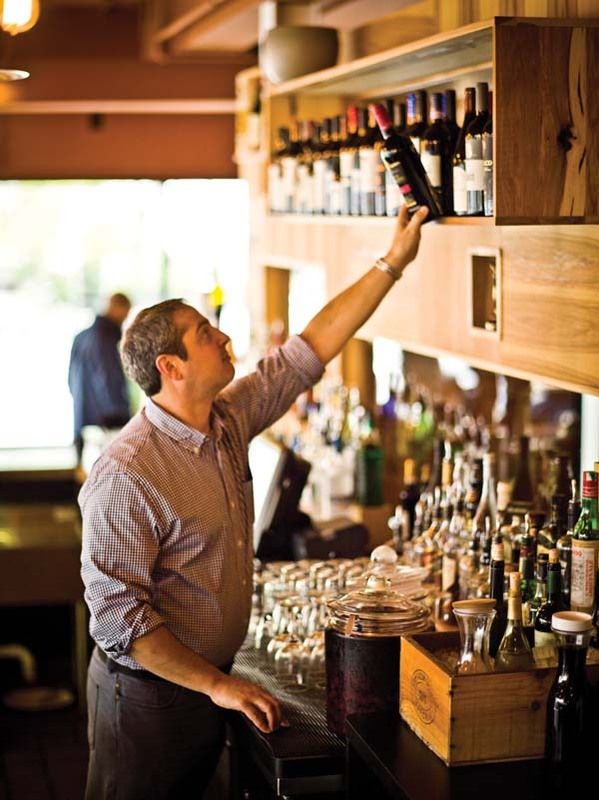 Chef Brendan McCall’s menu at Mani Osteria is a blend of modern, eclectic Italian and some plain old run-of-the mill dishes prepared with inventive deviations. Among the first courses, the pork belly and the chicken-liver pâté are standouts. I’m not usually a fan of chicken-liver mousse or wurst. Here, however, it has the addition of pistachios and garlic and a touch of coriander, all strained three times by McCall so that it comes to the table lovely, smooth, and light — a must. Other recommended first courses include an order of black olives that arrive warm and scented with orange peel and rosemary. Ceci beans and lentils in sweet tomato relish are served in small latch-top Mason jars. There are also the old-standby orders common everywhere these days: raw salmon and beef carpaccios, dishes of calamari (in a spicy tomato broth with aioli and mint), octopus (charred and served with celery and arugula), and an “arancini” (fried risotto croquettes with prosciutto and tomato-based romesco sauce). 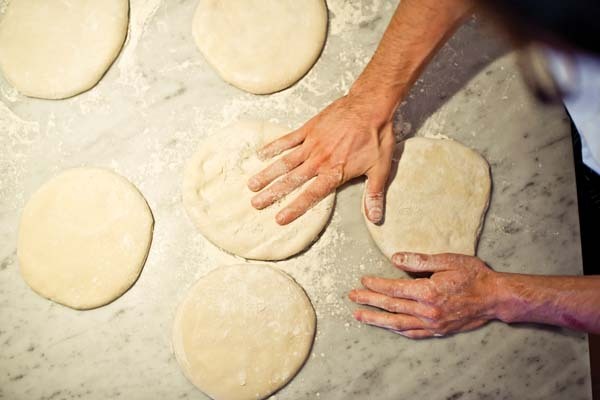 Top: Pizza dough being shaped. 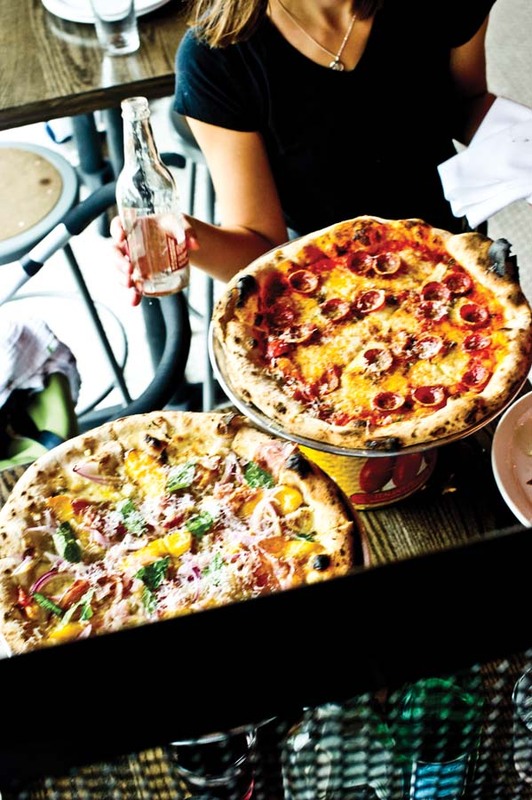 Bottom: All pizzas are wood-fired and are served on large San Marzano tomato cans. The pizzas, of which there are 12 choices, range from the utterly simple margherita (San Marzano tomatoes and basil) to the more densely populated version with meatballs, ricotta, mint, and pickled chiles. The best, in my opinion, is the simple A2, with asparagus, white anchovies, and a runny poached egg — simple and delicious. The pizza stands delivered to the tables are also inventive; they’re huge, colorful restaurant-size empty San Marzano tomato cans. The pastas are not to be missed. My choices: the pappardella in a Bolognese sauce with basil, and the cannelloni with summer squash, ricotta, and tomato sauce. 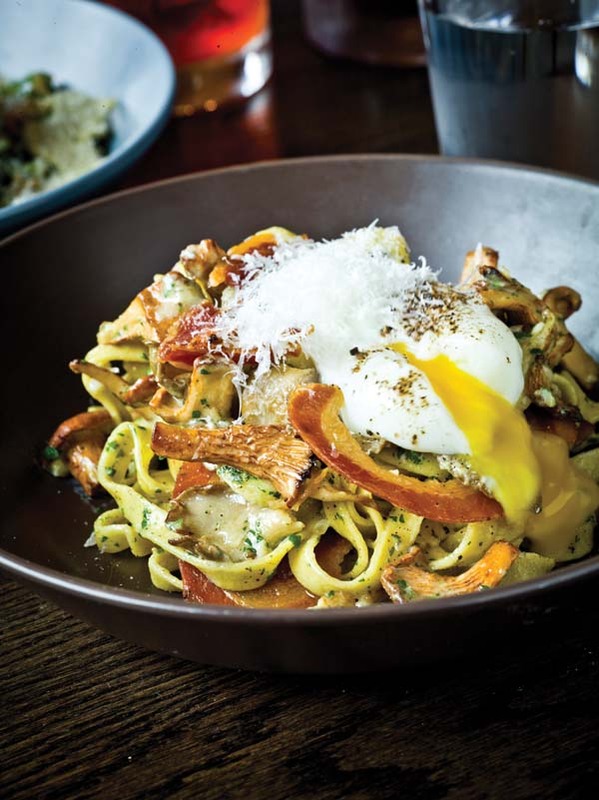 Left: House-made pastas include Tagliatelle — carbonara, trumpet mushrooms, and pancetta. Right: Managing partner Adam Baru. That’s basically what you get. Mani Osteria is well worth a visit — on many levels. 341 E. Liberty, Ann Arbor; 734-769-6700, maniosteria.com. L & D Tue.-Sun.